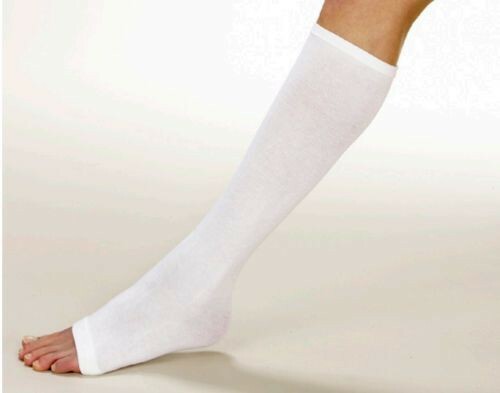 Standard Leg Garment is a leg sleeve used to treat symptoms associated with chronic lymphedema. This tight-fitting compression therapy leg sleeve gently stimulates blood flow throughout the calf and ankle to effectively reduce swelling, inflammation and fluid retention. Available in either beige or white, this compression therapy leg sleeve is a non invasive way to combat the painful side effects of chronic lymphedema. Standard Leg Garment is a comfortable shield that protects the skin while you perform a variety of different daily activities, from running errands to grocery shopping. 100-percent latex-free, these leg sleeves employ a soothing, massaging action to efficiently fight swelling, pain, fluid retention and redness throughout the day. 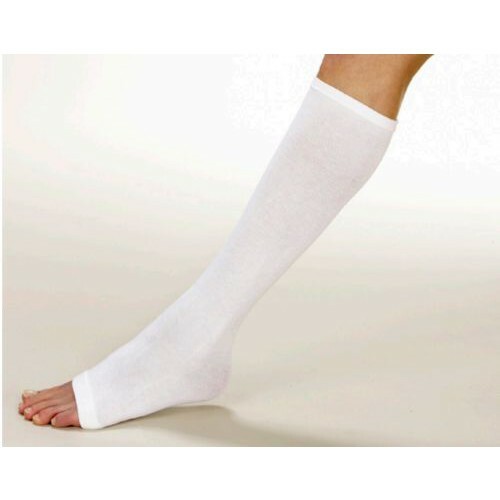 You may also be interested in additional compression therapy stockings, such as Jobst Sensifoot Unisex Knee High Diabetic Mild Compression Socks 8-15 MMHG. Gentle yet firm compression slowly stimulates blood flow to effectively reduce symptoms of fluid retention and swelling associated with lymphedema. Neutral, low-key beige or white colors blend in with regular clothing and are suitable for daily wear. Length of sleeve extends from the calf to the bottom of the foot and leaves the ends of the toes revealed for a comfortable, breathable fit.